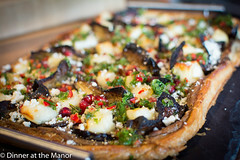 We were pleased to be cooking from Sabrina Ghayour’s new book, Sirocco, this weekend. Sabrina is a fellow supperclub host done good. 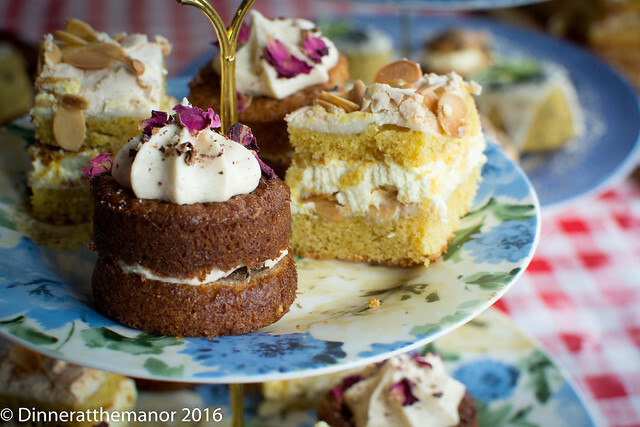 Her clever recipes are Manor favourites because they are simple to follow, use accessible ingredients and always super tasty, she’s a genius! 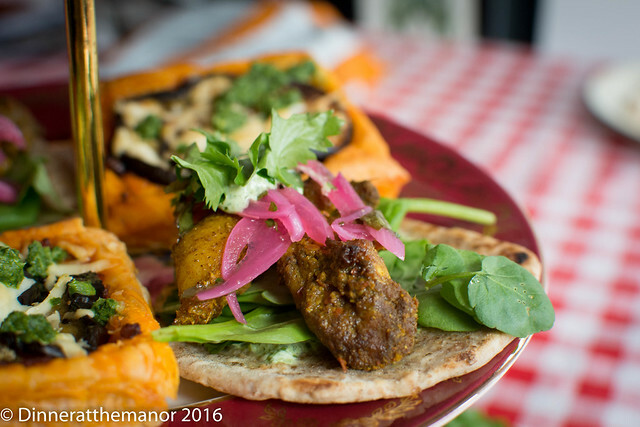 We served up a hearty Autumn lunch to add a little Middle Eastern colour and spice to what was otherwise a dreary, wet November day. Our welcome cocktail was a preserved lemon gin martini. We went one step further than Sabrina by adding the brine from the lemons into the gin, a bit like a dirty martini. This was slightly salty, sweet from honey and sour from lemon juice. Probably not everyone’s cup of tea but a very decent take on a dirty martini we felt! 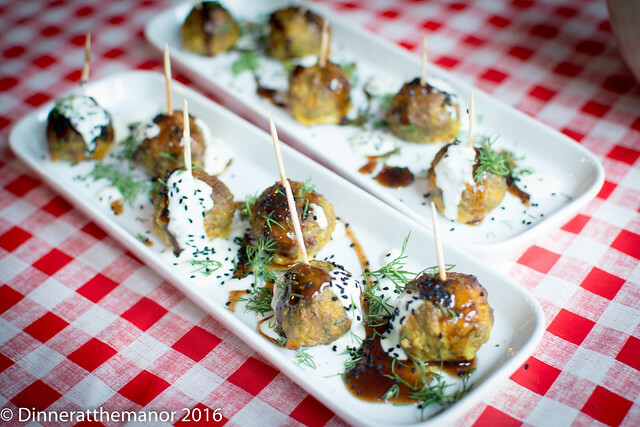 Canapés included fennel and lamb “lollipops” – little lamb koftas flavoured with lots of fennel, apricot and spices, served with yoghurt and tamarind. 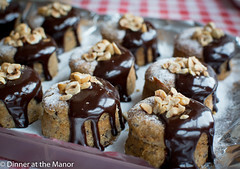 a lovely combination of sweet and savoury. 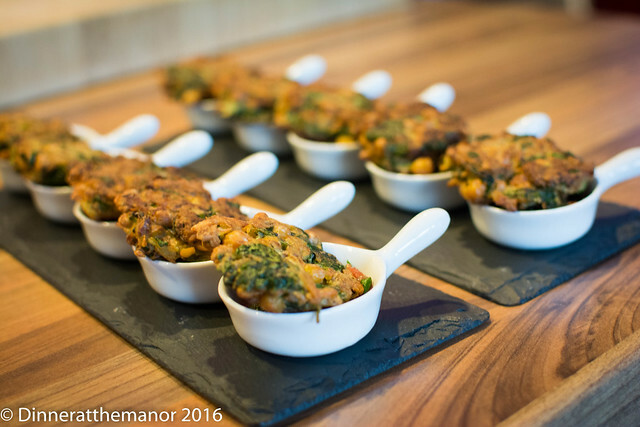 Also on offer were little potato and chickpea latkes. These crunchy little morsels were full of flavour from cumin and coriander seed and came atop a spicy tomato and coriander salsa. 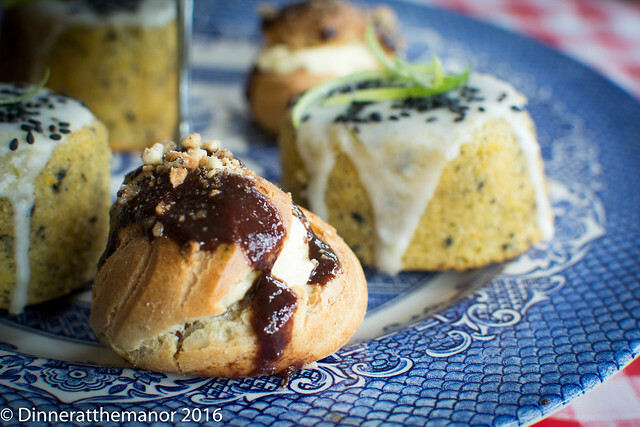 We love a slider at the Manor and we combined a number of Sabrina’s recipes to create a Persian duck version. A whole duck was slow roasted with Persian spices and then shredded. This was drenched in honey and pomegranate molasses and then served in a little milk bun with a crunchy carrot, pomegranate and tahini slaw. This was swiftly followed by spiced orange and thyme skewers and freekeh salad. Chicken thighs were marinated overnight in orange, marmalade, thyme and and array of spiced and grilled till charred. 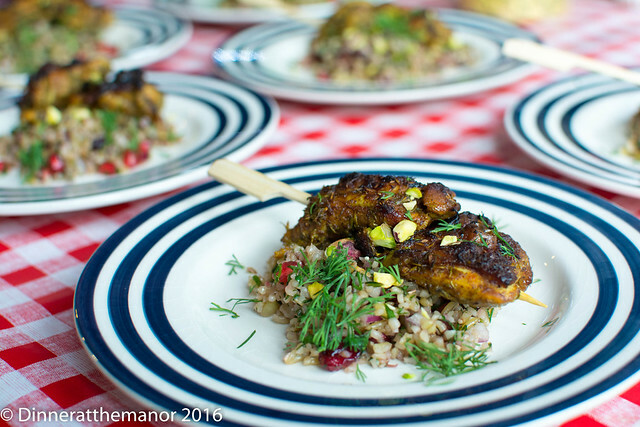 The freekeh was spiked with sweet and sour flavours such as pomegranate and dried cranberries then freshened up dill and coriander. We couldn’t do a Middle Eastern event without some form of tagine. 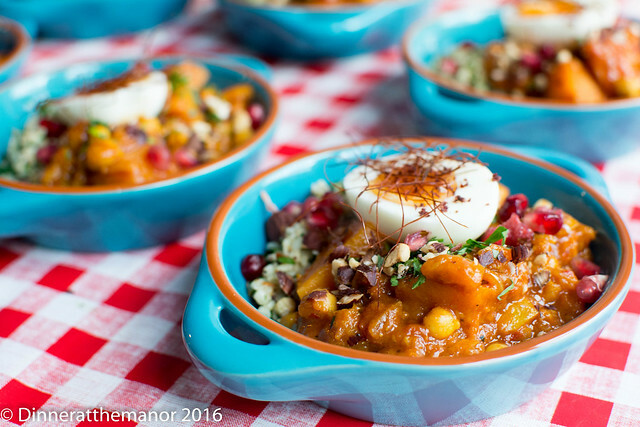 To cut through all the meat this came in the form of a pumpkin, harissa, apricot and preserved lemon tagine. This was a lovely balance of spice, sweetness and savouriness. 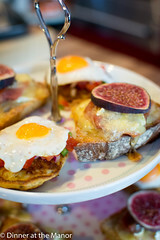 Sabrina serves hers with a soft boiled egg atop, so who are we to argue?! 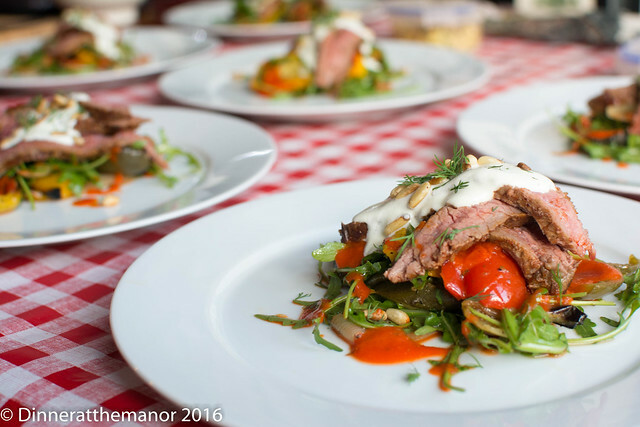 Our last small plate was seared steak with roasted vegetables served with two dressings, red pepper and a lemon yogurt. The vegetables are roasted until charred then tossed with, drizzled with the sauces then topped off with pink seared beef. A striking, tasty dish indeed. Dessert was a delicious blackberry and pistachio frangipane tart. The sweet pistachio paired up well with the tart blackberries. 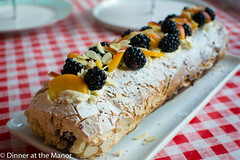 Alongside this was a very decadent cardamom and rose ice cream and some rose macerated blackberries. Sweet and satisfying. 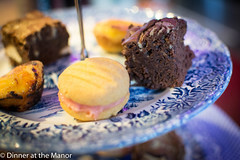 And finally our petit four were lovely little sumac and orange shortbreads. 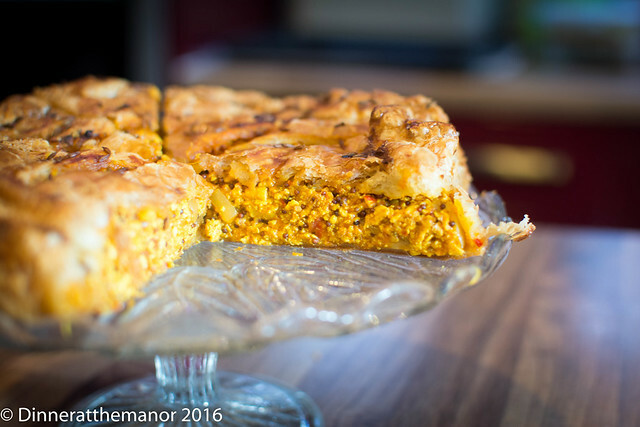 Not a technically a Sabrina recipe but celebrating the best of Persian flavours nonetheless! That’s it for this year. We’ve had a fab time cooking up some lovely things. 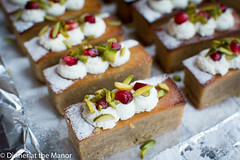 We’ll be back in the new year cooking up some more treats from Rick Stein and Ottolenghi, yippee! 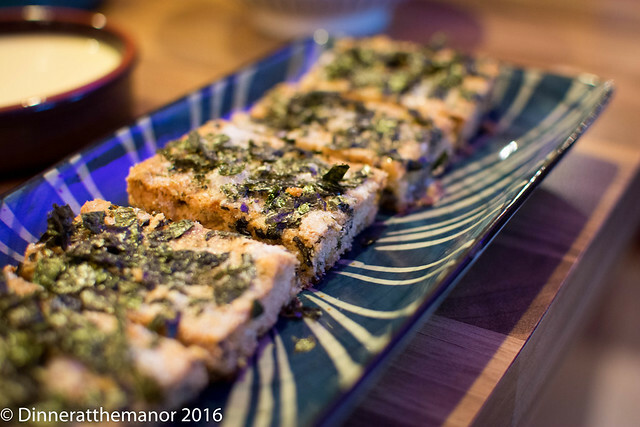 This entry was posted in Past Events and tagged 2016 Dates, Dinner at the Manor, Leeds, Middle Eastern Food, secret supperclub, Supper Club, supperclub, Underground Dining, Underground Restaurant, Yorkshire on November 13, 2016 by martinimanleeds. 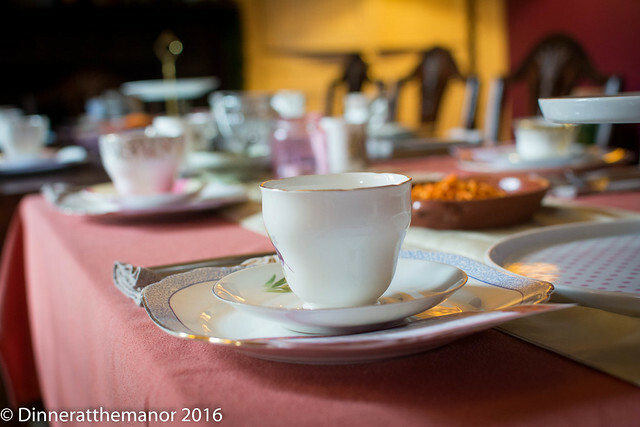 In less than a week’s time we’ll be opening up the doors of the Manor for our penultimate 2016 supperclub! The them this month is Middle Eastern, using Sabrina Ghayour’s marvellous Sirocco for inspiration. 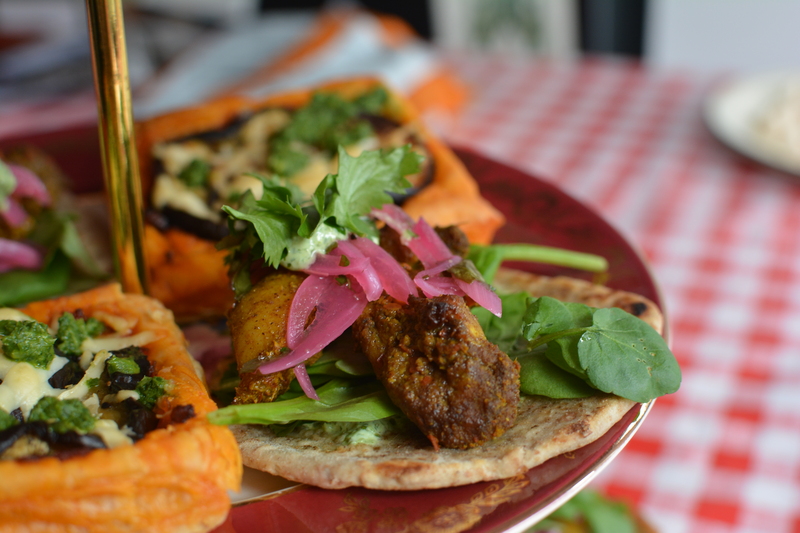 We’re big fans of Sabrina, her dishes are simple, straightforward and so so tasty. 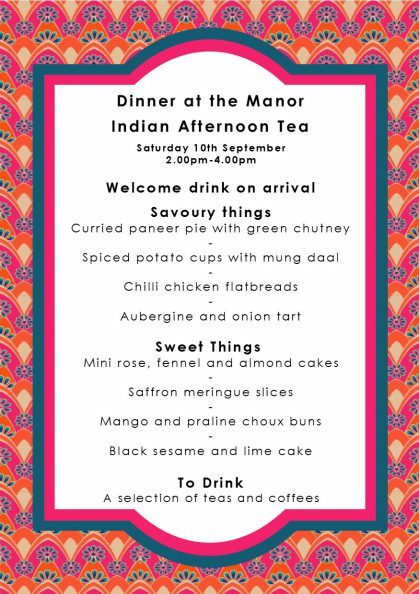 We’re excited about the menu and excited to be greeting another bunch of lovely guests. So here’s the menu! Let us know what you think! 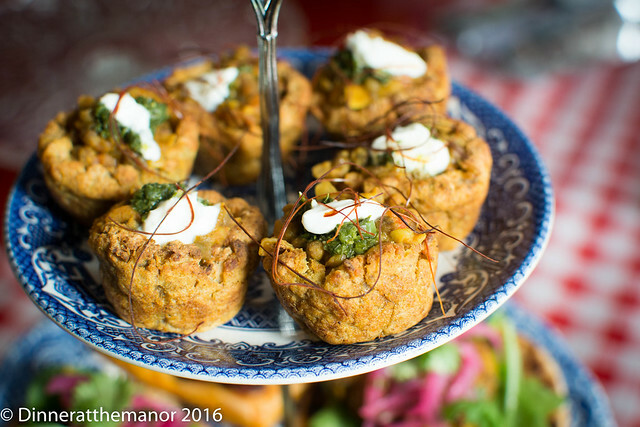 This entry was posted in Menus, Upcoming Events and tagged 2016 Dates, Dinner at the Manor, food, Leeds, Menu, Middle Eastern Food, Supper Club, supperclub, Underground Dining, Underground Restaurant, Yorkshire on November 6, 2016 by Susie Barker. We’re a bit late with this post but better late than never! In October we celebrated our 5th birthday. Never did we think when we held our first event in 2011 that we’d still be holding events and that the lovely folk of Leeds and beyond would still want to come! 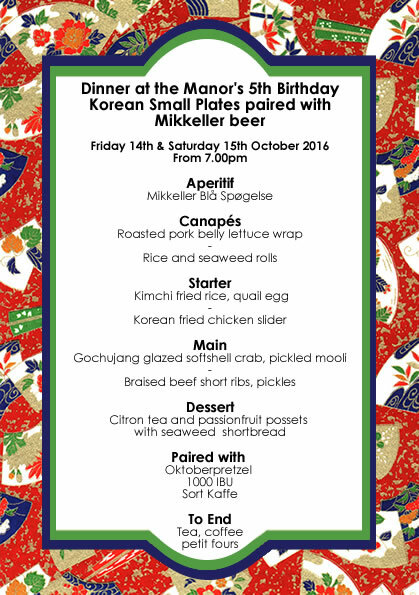 Our celebratory event’s theme was Korean (our favourite food of the moment) paired with beer by Mikkeller, one of our favourite brewers. And because it was a celebration, we opened our doors for two nights! Each guest received three bottles to pair with the meal as they wished. These were Oktoberpretzel – a German style beer brewed with pretzels, 1000 IBU – a bitter, highly hopped Belgian beer, and Sort Kaffe, a coffee infused porter. We started off the evening with glasses of Blå Spøgels, a tart blueberry lambic which was very reminiscent of a kir royale, only a beery version. 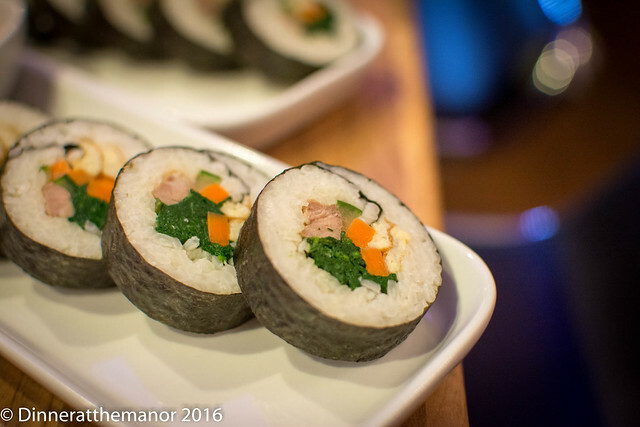 This was paired with our canapes, the first were rice and seaweed rolls – a Korean version of sushi, using steak and an assortment of vegetables. Pretty virtuous to contrast with the next canape, roasted pork belly lettuce wraps. This was soft pork belly, slow roasted in Korean bean paste broth. 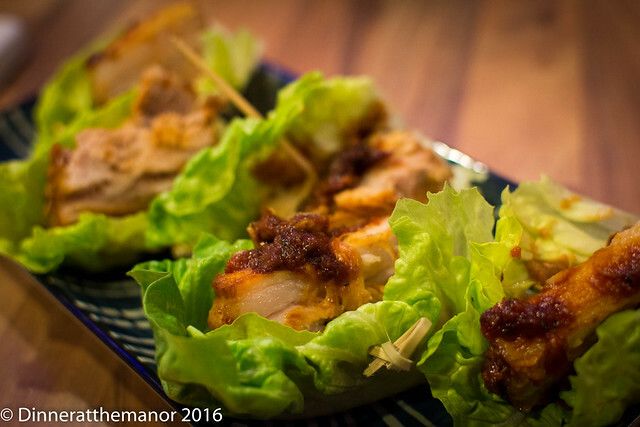 The pork was enveloped in a crunchy lettuce leaf and smeared with more umami bean paste, lovely! 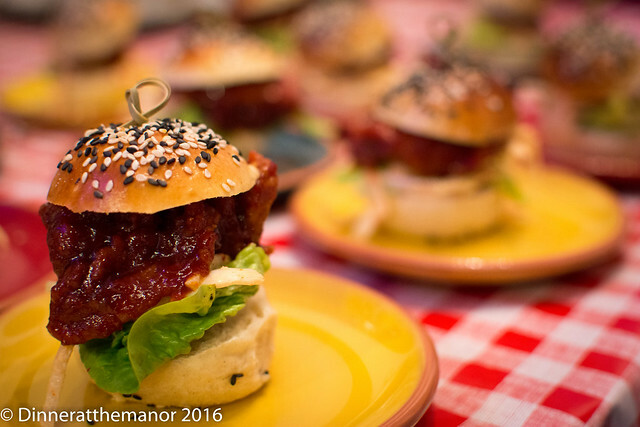 For our first starter, our guests were treated to Korean fried chicken with a twist, served up as a slider rather than the traditional wings. 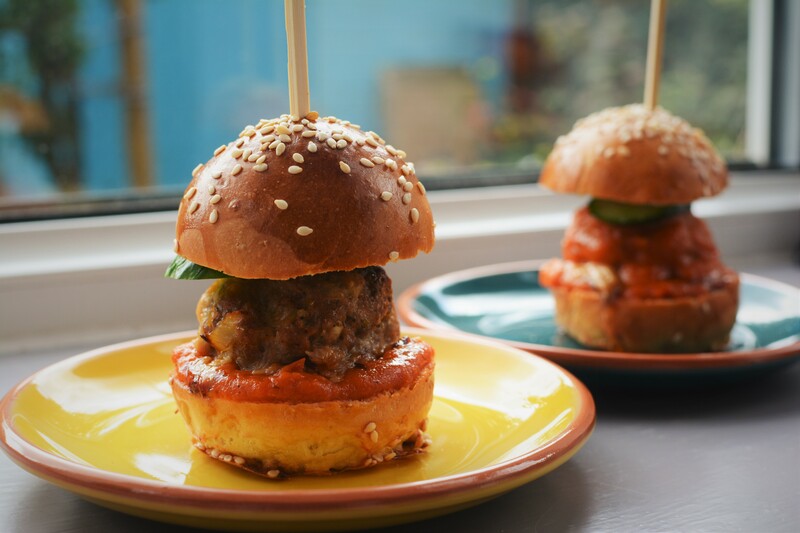 Crispy fried thighs coated in spicy, sweet sauce served in miniature brioche buns. 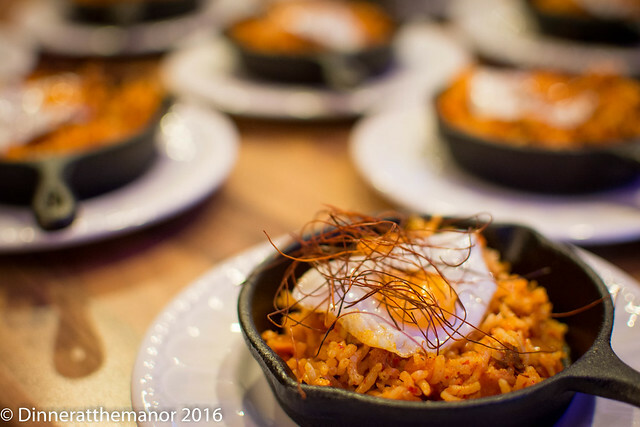 This was followed by the best hangover dish ever – kimchi fried rice! We served up our take in pretty little frying pans. Steamed rice was cooked up with loads of veggies, chilli flakes and a ton of spicy, stinky kimchi! Topped with a runny egg and paired with a kimchi bloody mary, this was sterling stuff! For mains, our first dish was braised beef short ribs with pickles. Beef ribs were marinated for 24 hours in soy, chillies, ginger and pear (to name a few of the ingredients) and then slowly braised for five hours until meltingly tender. To accompany these were a duo of pickles, a sweet pickled onion and a spicy quick kholrabi “kimchi”. Crab was our next course, but not just any old crab, deep fried softshell crab to be precise! Our crispy offering was coated in moreish spicy bean paste and served with a creamy mayo dip and tangy, pickled mooli, yum! 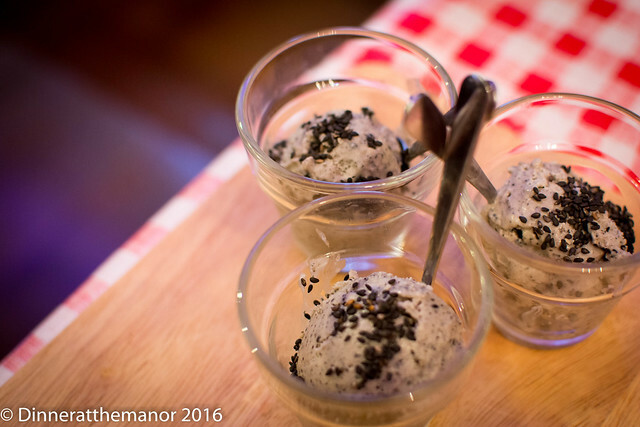 After a short rest, our pre dessert was a small serving of black sesame ice cream, a cooling sweet and savoury combination to cleanse the palate before dessert. 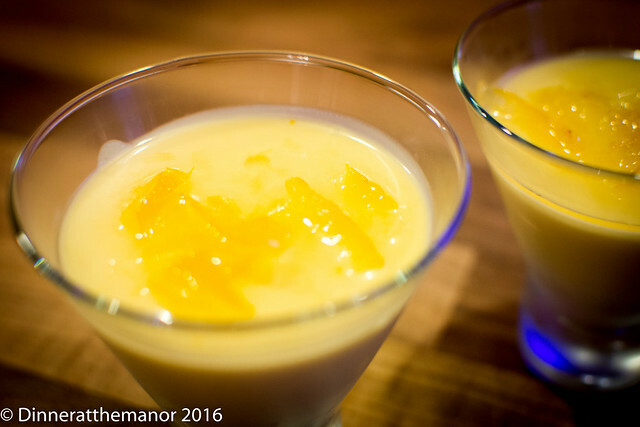 Speaking of dessert, this was a deliciously tart passionfruit posset – Korean style. 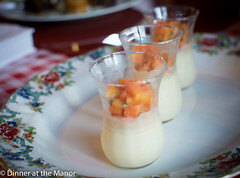 Each tangy posset was topped with a syrup of Korean ‘Citron Tea’. Citron tea is bit like marmalade, with a lemony tea flavour. I’ve no idea whether the Koreans eat it or drink it! 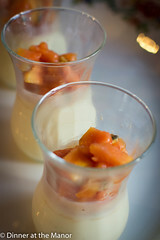 But it made a lovely, sharp topping for the creamy possets. 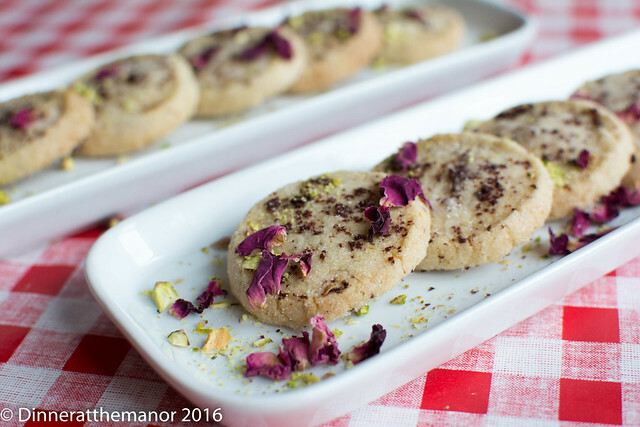 These came with crumbly, sweet and salty seaweed shortbread. 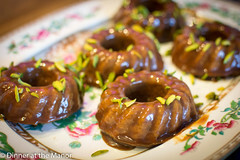 To accompany tea and coffee, our petit fours were divisive and very much split the crowd. 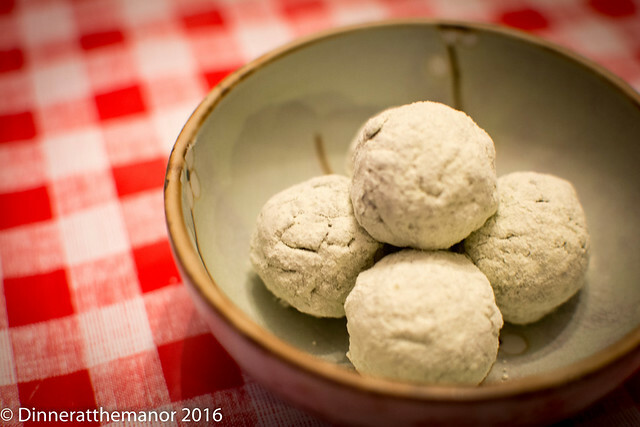 I made glutinous rice balls coated in matcha, a traditional sweet . They were mildy sweet and bitter as Koreans aren’t known to have a very sweet tooth. These certainly pushed the boundaries. 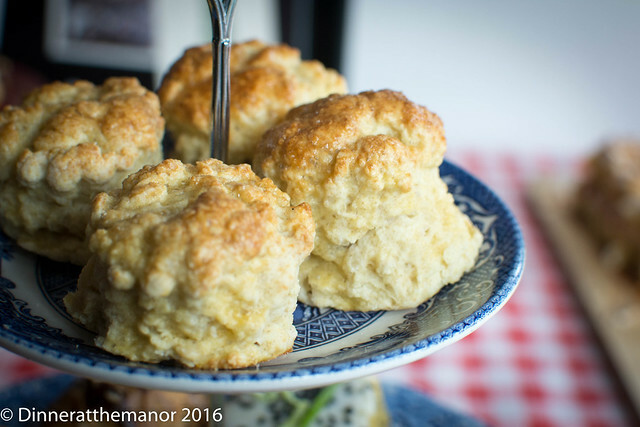 One guest described them as “horrific”…compliments indeed! All in all a lovely evening was had, over the past five years we’ve learnt a lot and we’re still learning. 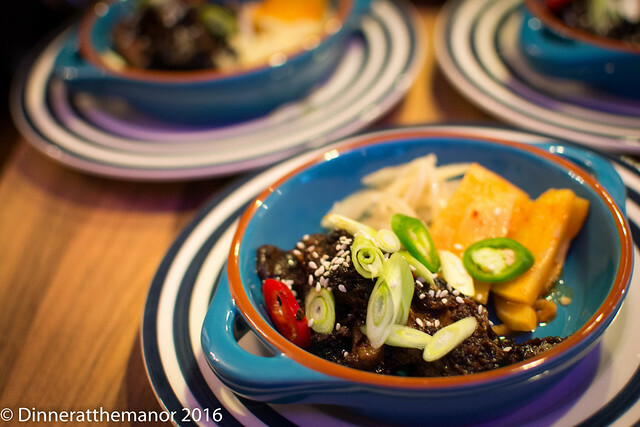 Every event throws up something new – such as cooking Korean food for a guest who didn’t eat spice, eek! Thanks to all of our guests who have dined with us and we’re looking foward to seeing many more. 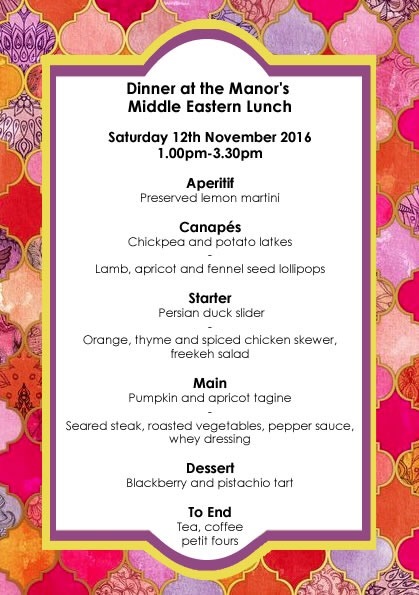 Next up is our Middle Eastern lunch, using Sirocco as our inspiration. 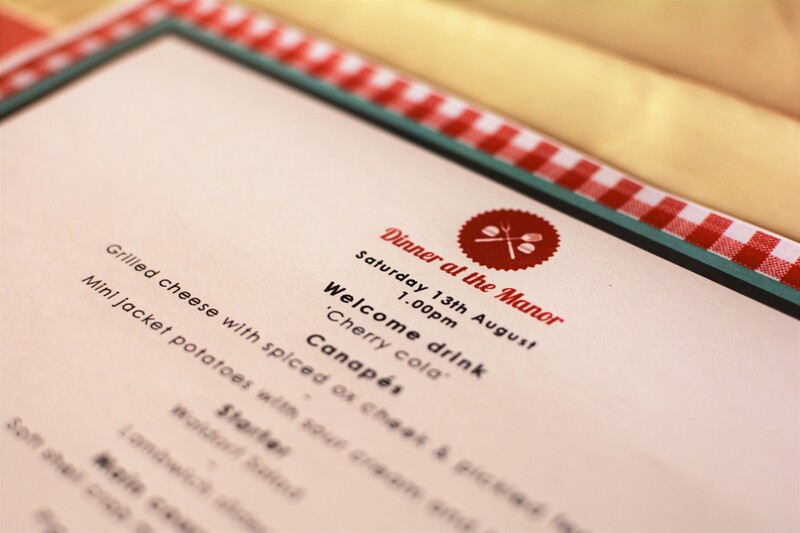 We’ll be publishing the menu shortly, so keep your eyes peeled! 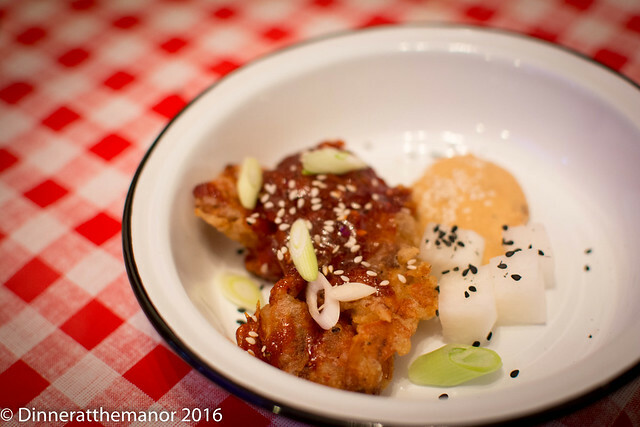 This entry was posted in Past Events and tagged 2016 Dates, Dinner at the Manor, korean, Leeds, Mikkeller, Supper Club, supperclub, Underground Dining, Underground Restaurant, Yorkshire on November 2, 2016 by Susie Barker. In only a few weeks we will be celebrating our 5th Birthday! Where does time go? It only seems like yesterday we were welcoming strangers through the front door for our very first secret supperclub. Our 5th birthday sees us serving up one of our favourite cuisines of the moment, Korean paired with one of our favourite brewery’s beer, Mikkeller. Expect a wonderful mix soft and crunch textures, hot and sour flavours all washed down with delicious beer. Can’t wait! 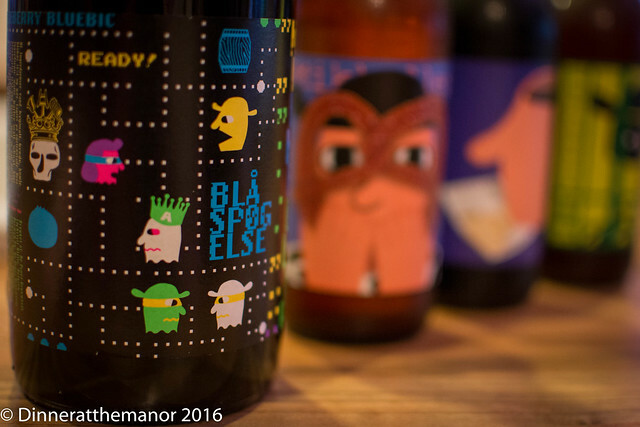 This entry was posted in Unknown and tagged 2016 Dates, beer, Dinner at the Manor, food, korean, Leeds, Menu, Mikkeller, Supper Club, supperclub, Underground Dining, Underground Restaurant, Yorkshire on September 24, 2016 by Susie Barker. A few weeks has past now but here’s a quick recap of what we served at our American Diner small plates event earlier this month. 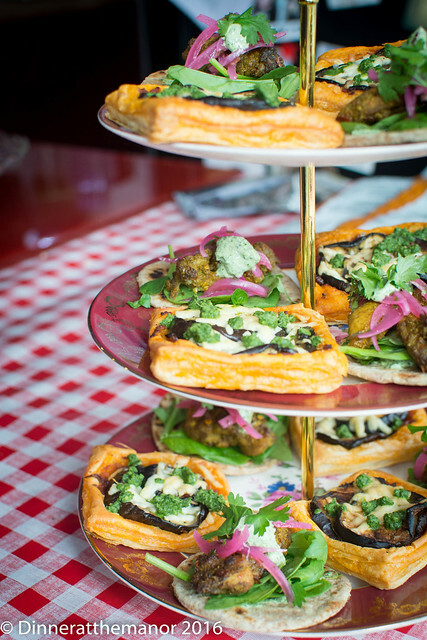 If we’re completely honest we had so many unused recipes from our ‘Filth’ events for Leeds Indie Food we thought we’d just put on a whole new event! 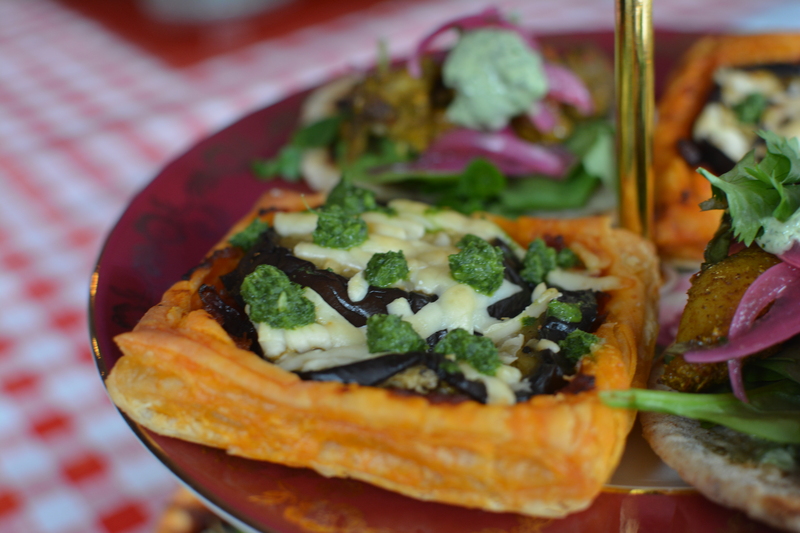 We channelled inspiration from the like’s of Duck and Waffle, Spuntino and Jamie’s America. This was a lunchtime event so we felt there was no better way to start this daytime dinner than with a lethal cocktail! This came in the form of our ‘Cherry Cola’ which was actual cherry coke reduced down to a syrup and spiked with salt, more sugar, vanilla and cider vinegar (bizarrely). The booze was a concoction of whisky, vodka, Campari and crème de cacao! As well as lethal this was also very sweet – one to have in small quantities! 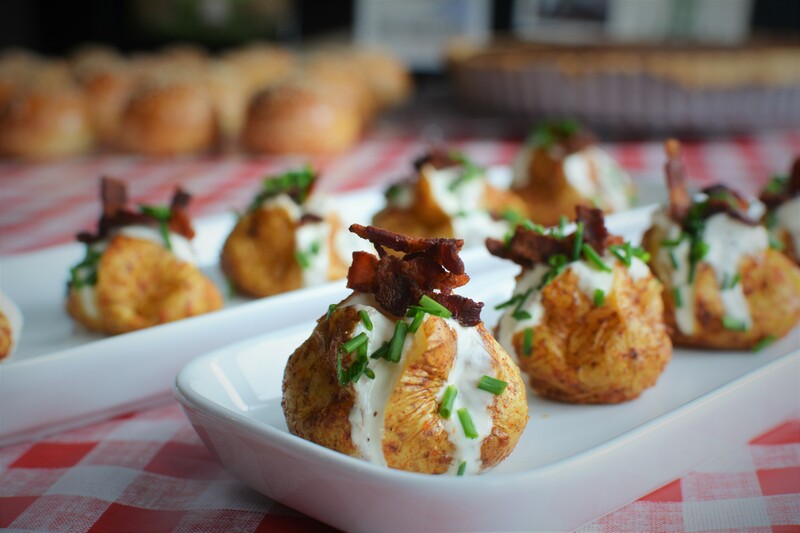 For canapés we offered mini jacket potatoes, which had a lovey smoky and spicy coating and came topped with sour cream, chives and crispy bacon. 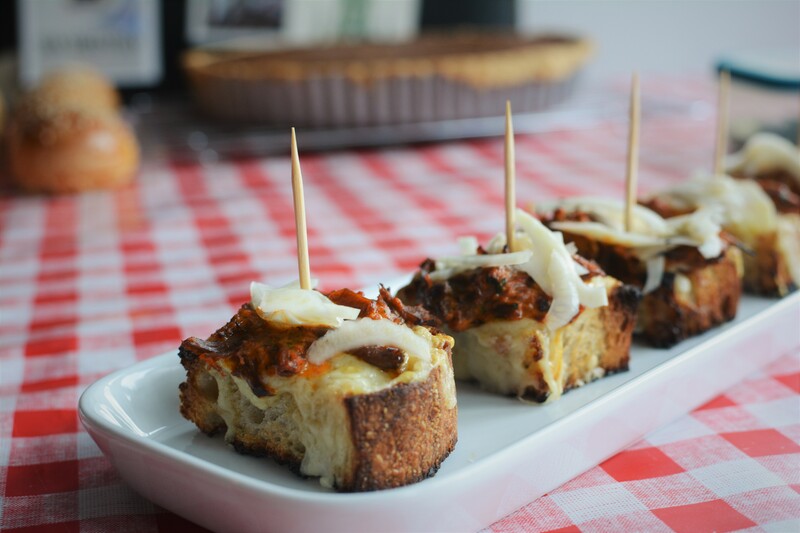 Also served up was a mini piece of toasted sourdough, grilled cheese, spiced ox cheek and pickled fennel – a very complex array of ingredients for such a small morsel! 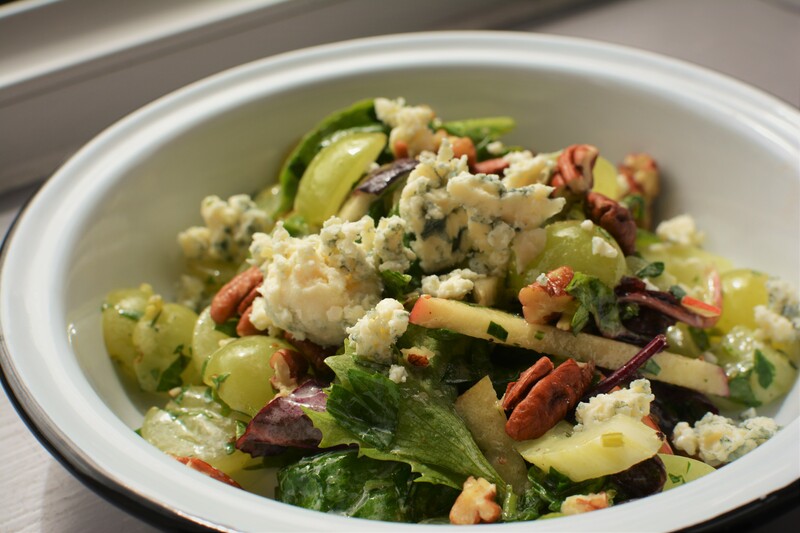 The small plates then started properly with a salad American style – Waldorf Salad… lightly dressed leaves spiked with grapes, walnuts and blue cheese. 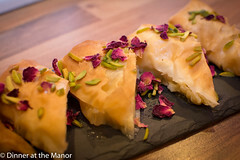 Knowing that we had a number of rich dishes to follow, this was a nice dish to break our guests in with! 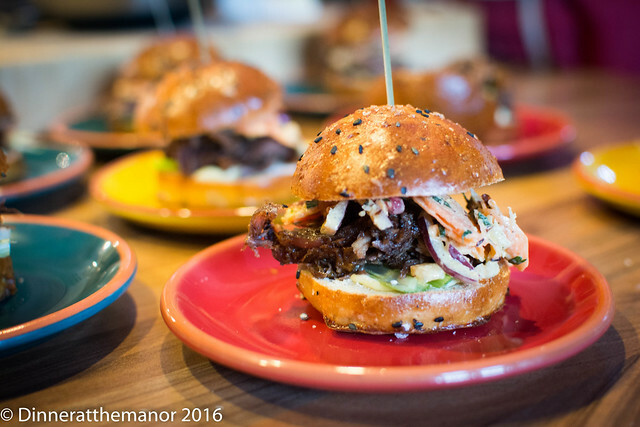 This was then followed by a slider with a difference – a lambwich slider! Succulent lamb mince was mixed with fennel, rosemary and chilli. Popped in a rich milk bun with lots of spicy tomato sauce and pickled cucumber, this was a messy treat indeed! 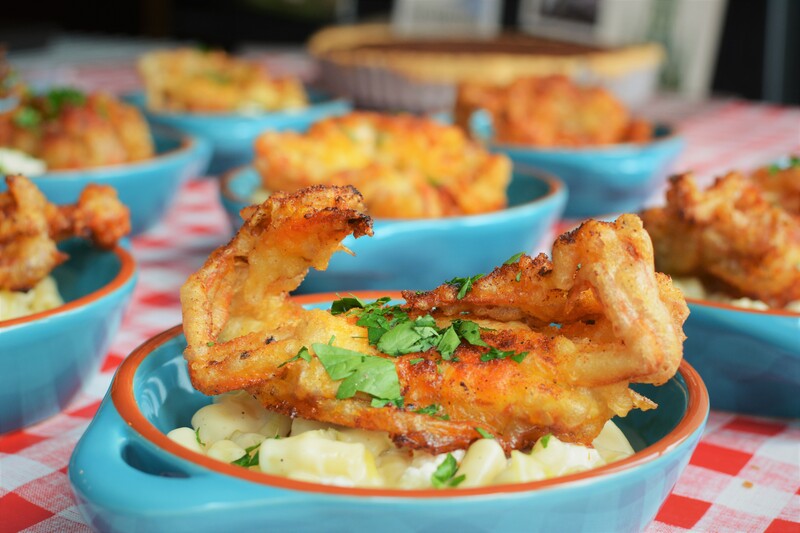 Next up was our mac ‘n’ cheese course, as you can’t do American without some form of the mac! A rich, creamy, gruyere filled mac ‘n’ cheese was topped with a deep fried softshell crab, which is our new favourite ingredient at the Manor. These crabs you can eat whole as they have shed their shells as they grow. By being able to eat everything, it has a lovely bisquey flavour…a perfect accompaniment for a bowl of mac ‘n’ cheese in my view! Our final savoury offering was pig and grits. 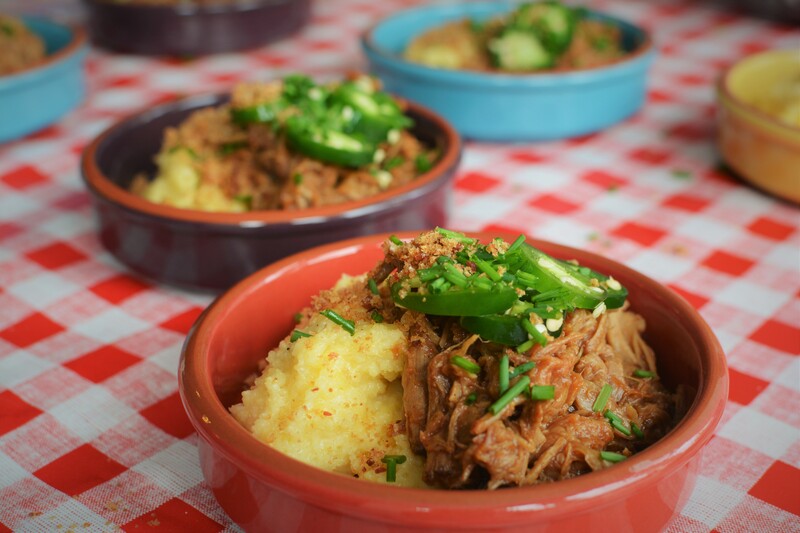 12 hour slow roasted barbecued pulled pork, atop cheesy grits and spiked with jalepenos. Sweet, smoky, spicy and creamy – all the delicious things in one comforting mouthful. A true taste of America! 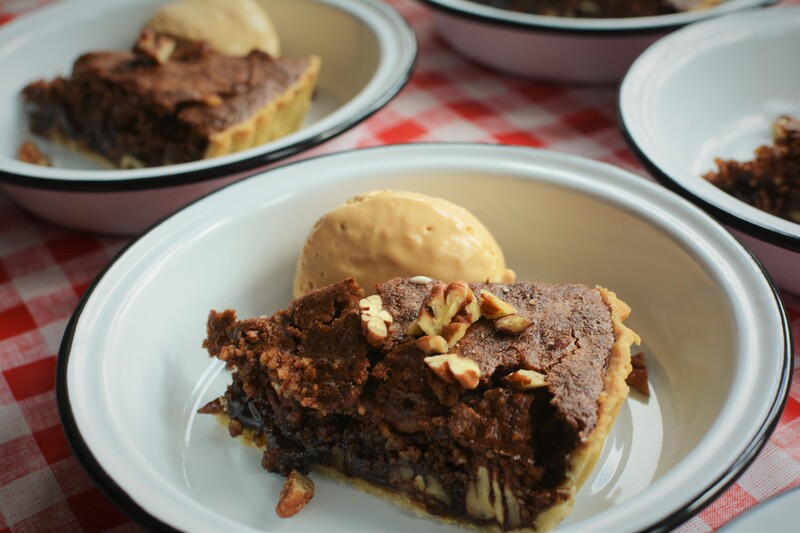 After such a light meal we felt pudding would be best served as pie – pecan pie to be precise with a filthy salted caramel ice cream! 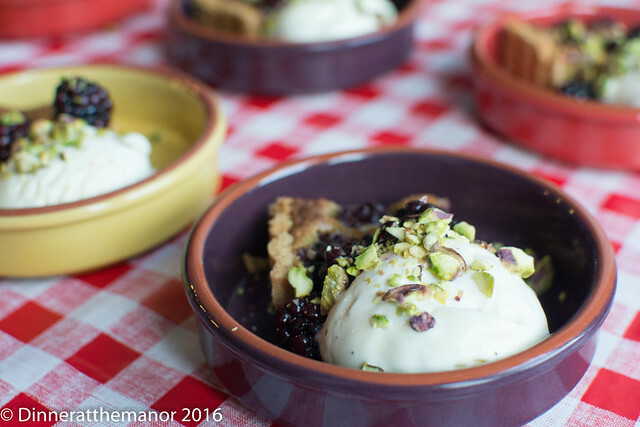 A rich, dark, nutty pie and decadent ice cream…Safe to say this pretty much finished off some of our guests. 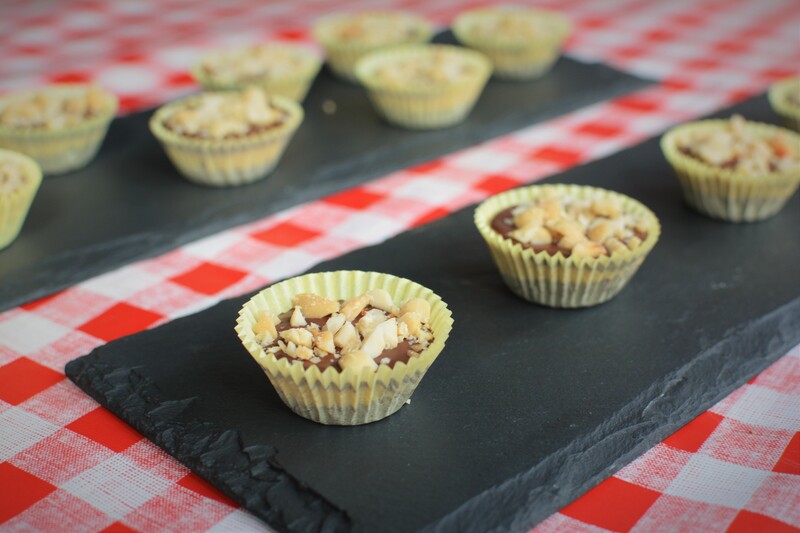 And finally, if that wasn’t enough, our petit fours were homemade Reese’s peanut butter cups. 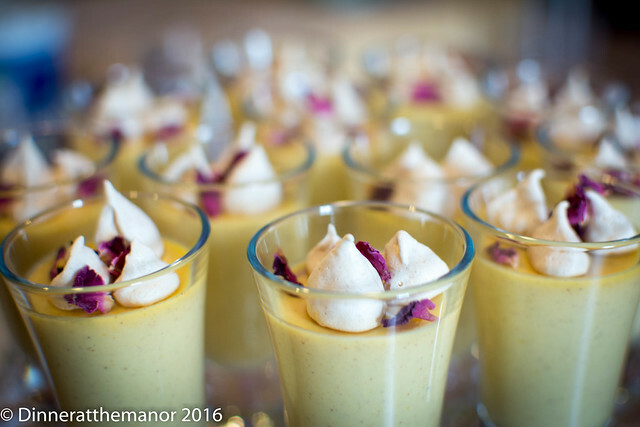 We knew we’d broken our guests when so many of these were left uneaten – all the more for us to eat! It’s great to keep seeing so many new faces at the Manor. 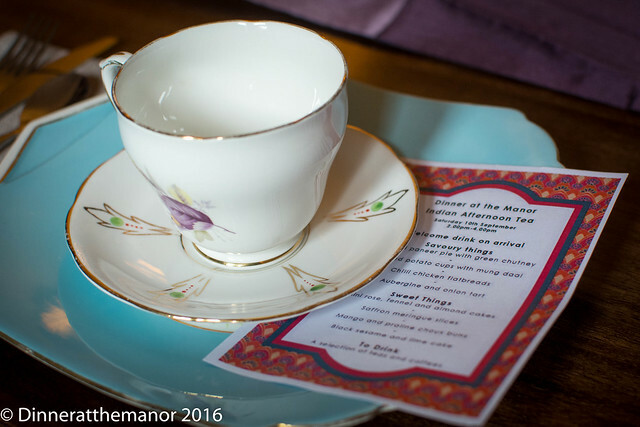 Next time we’ll be welcoming people in for an Eastern inspired Afternoon Tea in September, see you soon! 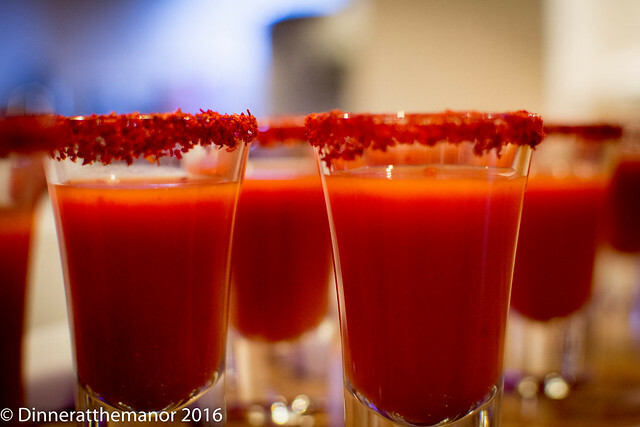 This entry was posted in Past Events and tagged 2016 Dates, American Food, Dinner at the Manor, food, Leeds, secret supperclub, Supper Club, supperclub, Underground Dining, Underground Restaurant, Yorkshire on August 29, 2016 by martinimanleeds.